As the early morning sun fell on the Kashmiri mountains, the drummers began to beat out the rhythm of celebration. For the first time in more than 60 years, an old trade route was being reopened. "This is a breakthrough for India and Pakistan," said Farukh Ahmed, a local official on the Indian side of the Line of Control (LoC) that divides Kashmir, as dozens of schoolchildren clapped in time to the music. It is a symbolic beginning, involving only a few lorries crossing in either direction, but it is important nonetheless. "We've sent some pulses, some dry fruits, some Kashmiri chillis and honey," said Nazir Dar, one of the traders on the Indian side who took part in this cautious opening exchange. But Nazir is already thinking big, planning for the day he can send produce all the way to the Middle East. "That way we will be saving time and the ports at Karachi and elsewhere in Pakistan will be utilised to their full capacity," he argued enthusiastically. "It will definitely benefit the economies of both countries and things will run smoothly." But first things first. Shortly after midday lorries draped in banners proclaiming friendship finally crossed the Peace Bridge on the LoC - a moment many traders have been waiting for all their lives. "It is sort of a dream come true that this road is opening up after 61 years," said Dr Mubeen Shah, the president of the Kashmir Chamber of Commerce in Srinagar. "Our fathers have traded on this road, and our grandfathers, so this is a very important day for us." But this has also been an extraordinary year in Indian-administered Kashmir. Over the summer, a dispute over land turned into some of the largest anti-India demonstrations seen in years. Trade with Pakistani-administered Kashmir may release a few of those pent-up frustrations, and even separatist politicians have described it as a welcome development. But they stress that the Line of Control should not be seen as an international border. 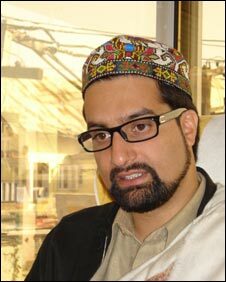 "We believe it's a ceasefire line, a temporary line which is basically dividing the state of Jammu and Kashmir," said Mirwaiz Umar Farooq, chairman of the All Parties Hurriyat Conference. "It's exactly like we saw in Germany where we had the Berlin Wall, people are divided, families are divided, and we want to see that this line gets thinner day by day." It is certainly important not to forget that Kashmir still has deep unresolved problems. Elections are due in Indian-administered Kashmir in November and December - elections which separatist groups say they will boycott - and the political temperature here can change and change fast. Trade across the LoC is now due to take place once a week. But no-one really knows whether the cautious optimism embodied by this new confidence-building initiative will have any long term impact. Kashmir has seen too many false dawns to hope for too much too soon.